Browse: Home » Join the debate! 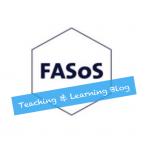 The FASoS Teaching & Learning Blog offers teaching staff a platform for the exchange of ideas, best practices and opinions. Blog posts discuss particular challenges and situations in problem-based learning, novel ways of testing, use of digital tools, interactive lecturing, and so on. Be between 500-800 words in length. Be submitted with a catchy title and a short summary of the central argument. Be submitted with a picture and a short bio of the author(s). Be submitted in British English, using ‘s’ instead of ‘z’. Be accessible, with specialist academic language kept to a minimum. Be communicated in a straightforward and readable manner, using active and engaging language (first person is preferable) to bring a particular topic to life. Be nuanced, in the sense of fostering a balanced and informed understanding of teaching and learning in higher education, in general, and at FASoS, in particular. Contain examples, such as assignment texts, slides, and pictures, where appropriate. Contain links to academic articles, news features or related blog posts, where appropriate. Contain suggestions for further reading and/or links to related faculty or university events. Do you have any questions? Would you like to contribute? Please write to Patrick Bijsmans (patrick.bijsmans@nullmaastrichtuniversity.nl) and Afke Groen (afke.groen@nullmaastrichtuniversity.nl).